The news about the upcoming racing simulator from Slightly Mad Studios - World of Speed - appear not often, but today, fortunately, we have the good news for the fans of the arcade racing games, or to be more exact, of the abovementioned one. Thus, recently, on the project’s official video channel, in Youtube the new World of Speed trailer has been published. This video demonstrates us the race of two cars - Dream Drive: Mazda RX-7 and Mercedes Benz 190E, - which will be presented in the game. Although the trailer lasts a bit more than one minute, even during this short lap of time we are able not only to look at both automobiles and evaluate their tuning, but also to get a view of different tracks, which are situated in various cities and countries. But that’s not all that this new World of Speed video shows us. As a majority of developers, who create the racing games, Slightly Mad Studios’ employees work hard on the weather effects in the project and their interaction with other game’s elements. Here you can see the chase of these cool cars not only in the sunny weather, but also when it rains. As it seems to us, the developers have managed to implement this function into the game quite well, but it’s always up to you to decide. That’s why we advise you to watch fresh World of Speed trailer, published below. Besides it, the creators of this racing simulator offer you to sign up for the game’s beta, the launch date of which is unknown so far. The subscription is available on the project’s official site. 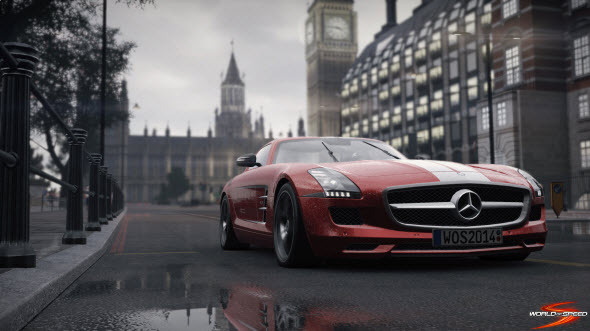 World of Speed game will be released sometime this year exclusively on PC. Did you like new World of Speed video? What do you think about the game? Leave your comments in the appropriate section below.